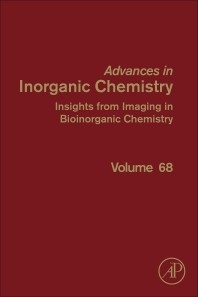 Insights from Imaging in Bioinorganic Chemistry continues a long-running series that describes recent advances in scientific research, in particular, in the field of inorganic chemistry. Several highly regarded experts, mostly from academe, contribute on specific topics. The series editor chooses a sub-field within inorganic chemistry as the theme and focus of the volume, extending invitations to experts for their contributions; the current theme is insights from metal ion imaging in bioinorganic and medicinal chemistry. It is anticipated that the audience will be other related practitioners and others involved in medical and health related research. The imaging technologies included have considerable relevance to a wider audience interested in diagnostic and therapeutic methods related to diseases of considerable public concern. Biomedical scientists are anticipated to be attracted to the subject matter. After attending Grammar Schools, Colin D. Hubbard read Chemistry at the University of Sheffield in England, earning honours Bachelors, and Doctor of Philosophy degrees, the latter with R.G. Wilkins and S.F.A. Kettle. Postdoctoral Research followed at MIT and Cornell (G.G. Hammes) and the University of California, Berkeley, (J.F. Kirsch). He accepted a position as Assistant Professor of Chemistry at the University of New Hampshire, Durham in 1967, and proceeded to Associate, Full and Emeritus status. In 1994 he joined the group of Rudi van Eldik as Visiting Professor and Research Associate, first at the University of Witten-Herdecke and subsequently at the University of Erlangen-Nürnberg, Germany. From 1998 – 2001 he served as a Research Manager at Unilever Research, Colworth, England. Since 2002 he has been a co-editor for Advances in Inorganic Chemistry (Volumes 54, 61, 65, 68 & 70), and a writer of review articles principally on the application of high hydrostatic pressure in inorganic chemistry reactions for mechanism diagnosis. He has spent Sabbaticals at the University of Kent, Canterbury, England, (E.F. Caldin), the University of Alberta, Edmonton, Canada, (H.B. Dunford), the University of Leicester, England (J. Burgess) and the University of Seville, Spain, (F. Sanchez).